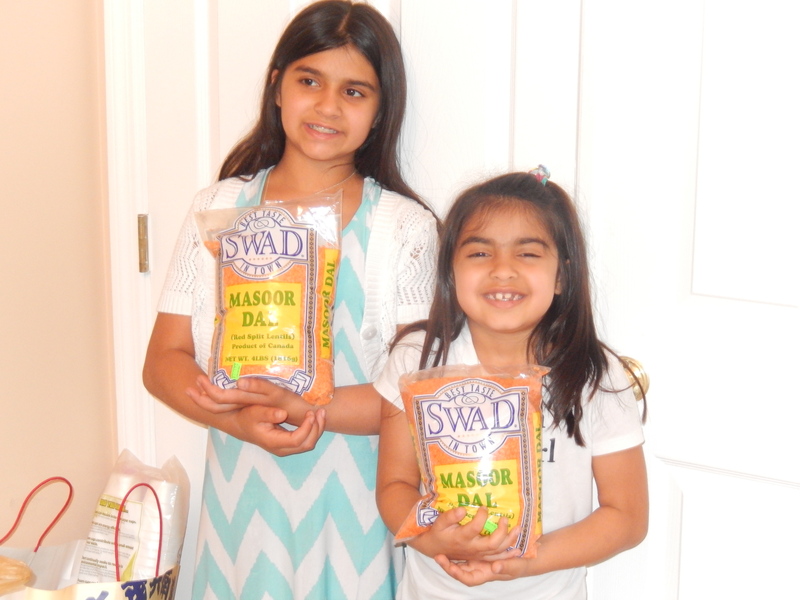 For their birthday this year, on memorial day week end, 10 years old Amenah and 7 year old Sofia Ghani decided to turn the birthday party to a GOOD DEED event. 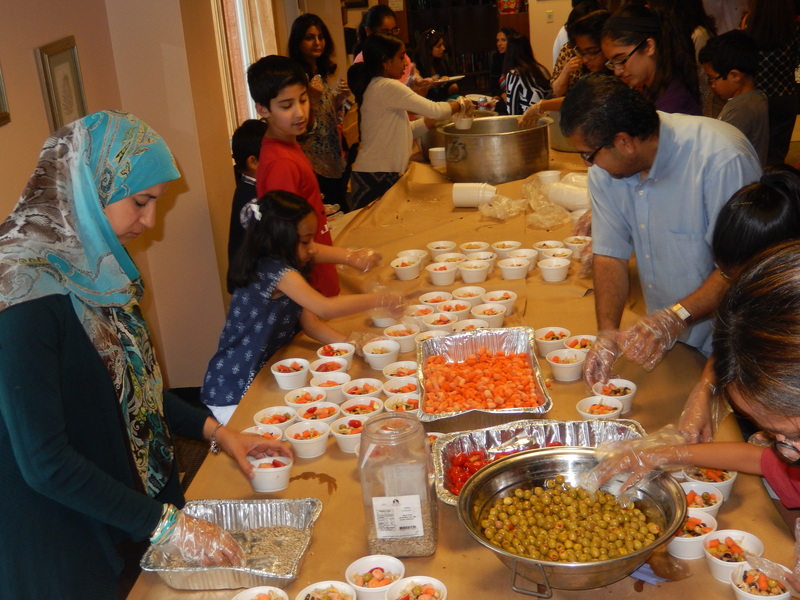 They invited 50 friends from various faiths; Muslims, Christians, Jews, Hindus, Sikhs to help them make 400 meals for the Homeless Veterans and Hungry in our backyard. Kids ages from 5 year to 15 years worked very hard for 2 hours to prepare 400 nutritious and healthy meals for homeless veterans. 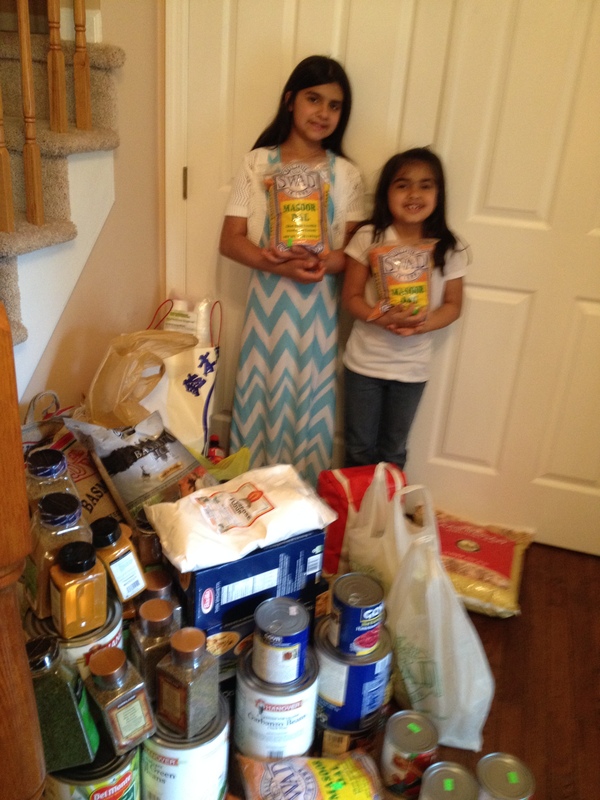 Ghani sisters also asked the guests to not bring any gifts, and donate, rice, beans and various food items for Hunger Van feeding programs. The party ended up collecting $1,600 in cash and 1,400 pounds of food items for Faiths Against Hunger feeding programs with Hunger Van. Samira and Muneeb Ghani born in Pakistan made Princeton area their new home after getting married 20 year ago. Samira said, “we love here, it’s a community with a lot of diversity and represents the melting pot”. Muneeb Ghani, a consultant in finance by profession, said, “We are very fortune to be part of American dream, and are trying to instill in our children good values of passion, kindness and caring. “We want our children to understand how blessed we are compared to 49 million Americans, who don’t know where their next meal is going to come from”, Ghani Said. 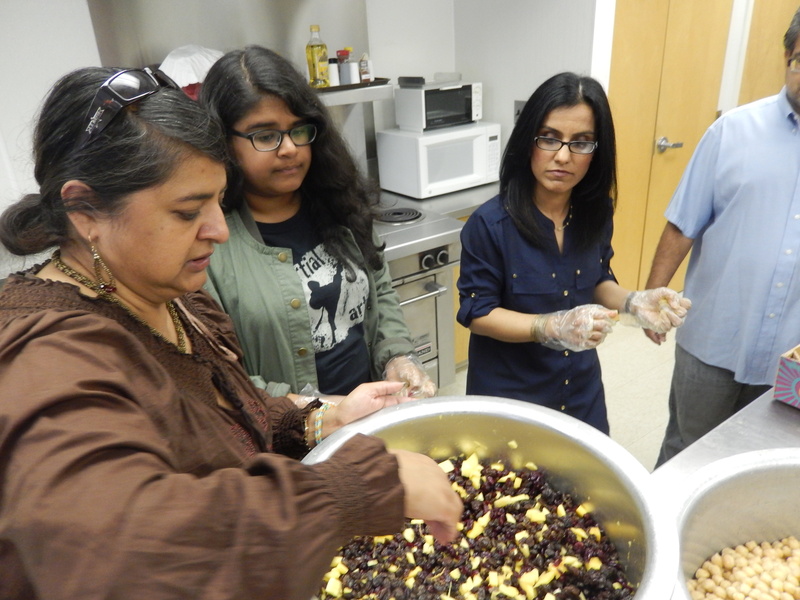 Samira Ghani took her daughter, Amenah to Trenton area soup kitchen to help Muslims Against Hunger Project feed the homeless and hungry in our backyard. When they returned home, they were very touched by the poverty and need they saw and decided to collect food and funds for Hunger Van Project on Amenah’s birthday. 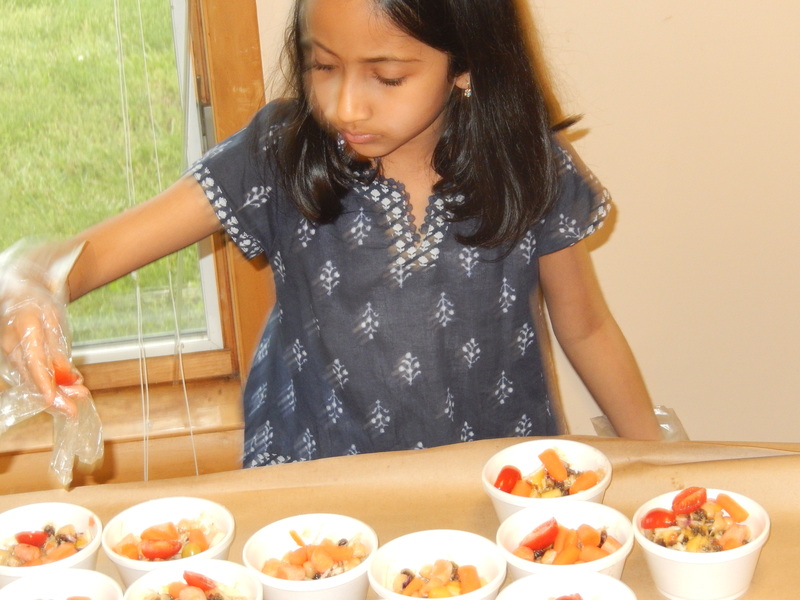 Click on the below link to see kids in action making meals for the homeless veterans on the 2014 Memorial Day week end. HUNGER VAN project has set a price of $6.07 per meal. 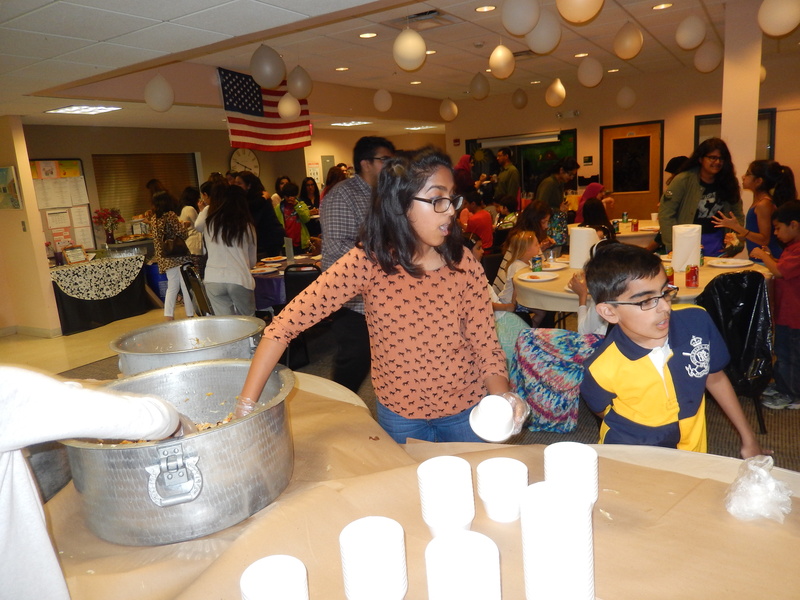 Considering that the average feeding event provides around 100 meals, sponsors are encouraged to raise $607 per event. HUNGER VAN project encourages sponsors to pool their resources, to hold fundraisers, or to view the HUNGER VAN project feeding event as an offering of charity. HUNGER VAN project will also help subsidize a feeding event for groups that are unable to raise the necessary funds (e.g., college student groups), but they encourage each sponsor to cover as much of the cost as possible. HUNGER VAN project accepts online donations at http://www.hungervan.org, and provides an easy way for donors to pay for as many meals as they wish to prepare. Once the funds have been provided and HUNGER VAN project has purchased the food and supplies, HUNGER VAN travels to a speciﬁed location—usually a home, a school, a community center, or a mosque or other place of worship—for food preparation. HUNGER VAN project recommends that sponsors provide 5–6 volunteers for this part of the feeding event. With that number of volunteers, it takes about two hours to prepare the meals. Sponsors have the option of providing a hot meal or a sandwich and salad. In either case, the meals are delicious and healthful. All menu items are vegetarian and have been created in consultation with a nutritionist to ensure their health value. HUNGER VAN project wants not only to feed hungry and homeless, but also to promote good eating habits. A hot meal usually consists of rice, vegetables, and a savory lentil or bean dish, along with bread, a banana or other serving of fruit, and water or juice. HUNGER VAN project transports the meals from the food prep location to the feeding location, where volunteers set up tables with heated serving trays. Clients are served cafeteria-style. The other meal option includes a sandwich and a salad. The popular “Honey-B” sandwich features peanut butter, honey, banana slices, and cinnamon on whole wheat bread. The accompanying “Chickaroo” salad is really a meal in itself. It contains chickpeas, mango or other seasonal fruit, raisins, sunﬂower seeds, lettuce, tomatoes, and olives, tossed with olive oil and a south Asian masala spice mix. Volunteers place the sandwiches in bags and ﬁll 8-ounce serving cups with the “Chickaroo” salad, and put them in individual bags along with a banana and a bottle of water. Once the food preparation is complete, volunteers clean up the preparation area, re-load the HUNGER VAN, and then travel to a location where hungry and homeless people congregate but that is not serviced by a nearby soup kitchen. There they set up their tables and serve or hand out the meals. In some locations, HUNGER VAN volunteers have become such a consistent presence that the guests arrive and begin lining up well before HV even gets there. and leftover food (if any) to the HUNGER VAN and HV returns home to prepare for the next hunger run. 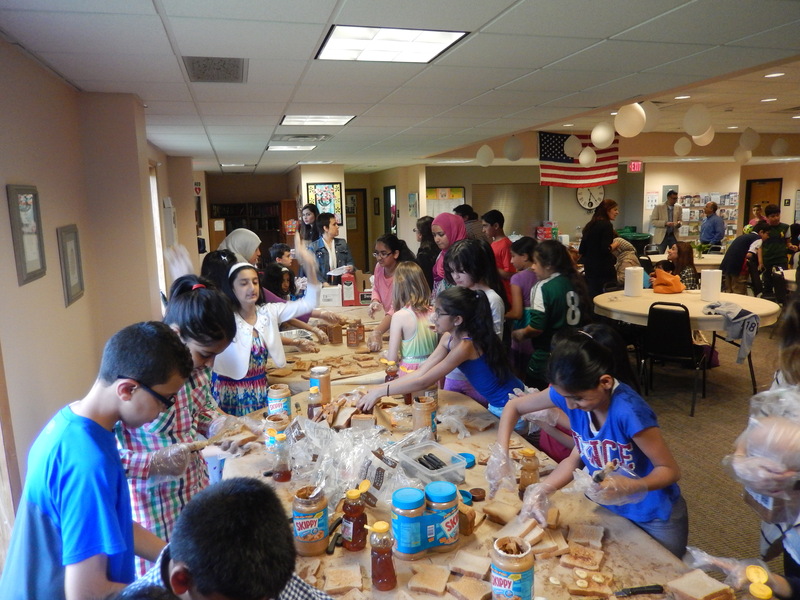 Hunger Van at Arab American Family Services – Bringing communities together.